Lambda@Edge provides you with the ability to bring compute power closer to client applications. With the recent increase in function limits and ability to send binary responses, as well as the addition of remote calling from functions, the capabilities of Lambda@Edge have grown. Amazon CloudFront is a global content delivery network (CDN). If you put data into CloudFront, it moves that data from centralized locations to locations nearer in the network to your customers, which means that they can receive the content more quickly. This lower latency and higher transfer speed means that your client applications can respond to network interactions more quickly and provide an improved user experience. In this post, I’m going to show how you can take an application with a relatively slow rate of changing data and use Lambda@Edge to both provide low latency data to application clients and remove unnecessary calls to a backend service. My example covers data for a rugby game season. Lambda@Edge currently supports the Node.js 6.10 runtime. Lambda@Edge deploys your functions to run in multiple AWS locations around the world. It can take a while for a function to be replicated and for the CloudFront distribution changes to propagate to our AWS locations around the world. Allow a few minutes for the initial CloudFront distribution to deploy. For every function deployment after that, allow some time for the new function to deploy to the AWS location nearest to where you are testing. A good practice in testing is to put a test flag or unique header into the response so that you know when a new version is being returned. Remove any insecure identifier in the production environment. When your Lambda@Edge function gets invoked, Lambda@Edge sends the associated log data to the nearest AWS Region relative to where you are testing or where your application users are. When you test your function, you need to check CloudWatch Logs in the nearest AWS Region. For example, if you are in the United Kingdom, and you are deploying the Lambda@Edge function to us-east-1, it is likely that your logs appear in eu-west-2 and not us-east-1. Be sure to check geographically near Regions if you cannot immediately find the logs in CloudWatch. The logs also contain the version of the function being tested, so that you always know which version of the Lambda@Edge function is running. Your Lambda@Edge function is invoked by CloudFront when it processes events. Part of that event flow includes checking its cache. If you use the origin request and response elements of Lambda@Edge and wonder why you’re not seeing things execute, check whether your request was cached within CloudFront. Check the headers in the response, and see if you are getting “CloudFront Cache Hit”. For example, if you inspect the HTTP response headers and you see an X-Cache header with “Hit from cloudfront,” then your response is coming from the CloudFront cache. If the response isn’t computed in the origin request or response, then it doesn’t show in the logs. CloudFront then returns the response packet to the user. 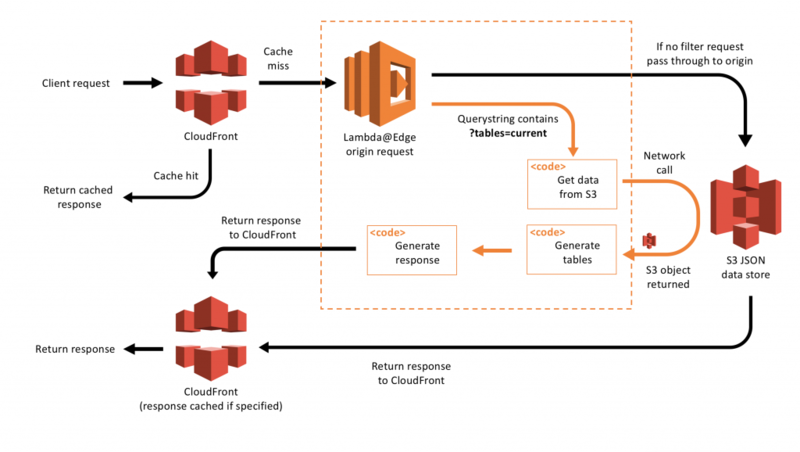 The Lambda@Edge function is triggered whenever there is no cache hit on CloudFront and it requests data from the origin. In this case, the origin is the S3 bucket storing JSON data. All the responses either from S3 or from the Lambda@Edge function go back through CloudFront, and can be cached if required. Here’s a purely fictional rugby tournament with 32 teams in four separate leagues (1st, 2nd, 3rd, and 4th), with eight teams in each league. All games are played on a Saturday during the season, although not necessarily at the same time of day. This gives 14 game weeks but only a relatively few number of updates that occur on a Saturday. The current season is completed up to game week 10. However, if any team scores 4 or more tries in the game, they get 1 point. That way, even if a team is losing badly, they can still get something out of the game. It also means that the data that you need to store needs to show the number of tries a team has scored in a game. The data is relatively simple JSON data. It contains all relevant information to work out everything that anybody might need, such as each current league table and who won each game. However, only the basic information is stored for each actual match, such as the data for the way teams can score points in a game and whether the game has taken place. So if the game hasn’t taken place, the first character would be 0 and all the numbers would be 0 as well. The score and league points can be calculated from this information. An S3 bucket holds data as an object. In this case, it is a simple file object that contains information about the rugby games that have gone on in a season. The data stored is the core data needed for the client application. This data needs to be in a format that is machine-readable and easily creatable. For the purposes of this, make it a simple JSON packet so that it can be easily updated by a human with an editor but also readable by a computer. Create the S3 bucket and CloudFront distribution. Make a Lambda@Edge viewer request function and origin request function. Set up the origin request Lambda@Edge function. You can upload the data file using the console or AWS CLI. Save with the filename rugby_data.json. Locate the S3 bucket that you already set up. Search for “rugby” to narrow the results. Select the bucket name and choose Upload. Drag and drop the downloaded file from step 1, or choose Add Files and choose the file from step 1. Don’t change any permissions and choose Next. Under Metadata, for Header, choose Content Type and application/json. Now you have the data stored in S3 for the rugby tournament, and you can retrieve that data via a request to CloudFront. This ensures that you can send back useful information to the client application requesting the data. Now that the data is uploaded to the S3 bucket, the CloudFront distribution has an associated domain name. The CloudFront distribution may take a short while to propagate across all points of presence. If the console distribution does not show State as “Enabled,” then wait a few minutes and refresh the console until it does. Select the distribution that you created earlier and note the domain name. When you visit that URL, you should see the dataset downloaded by your browser. Depending on how your browser handles JSON, you either see the JSON in your browser, or it prompts you to download the file to your computer. The only two elements to worry about here are the Path Pattern, which has been set to rugby_data.json and the fact you have forwarded query strings and not cached them. This means that you can link the Lambda@Edge function to only this pattern. The cache does not see a URL with different query strings as the same URL, and therefore returns it from the cache. This now allows you to connect the Lambda@Edge function to just this behavior instead of to all requests to this distribution. At this point, you can make a request to retrieve the data from the CloudFront distribution to retrieve the rugby tournament data as a full dataset. What you have done so far is relatively simple. What if you wanted to provide a subset or even a different or computed dataset of this full dataset? Lambda@Edge allows you to generate a different HTTP response without retrieving and forwarding the response from the origin, which in this case would be the rugby_data.json S3 object. If you return an HTTP response in either the viewer request or the origin request, then the origin is never called, and the viewer sees the generated HTTP response. For more information, see Generating HTTP Responses in Request Triggers. The viewer request is invoked on every request at the edge. It is processed before it reaches the CloudFront cache. This means that the function only has access to the header and request information from the user. An origin request gives you the opportunity to provide a response that could be cached if needed, and as such limit your compute if needed. It is processed only if the CloudFront cache doesn’t have the request cached. For example, if a request comes in for a JSON object at /details.json and you have an origin request that returns a JSON object in the origin request Lambda@Edge function and you specify that it is cached for an hour after the first call, then after that first call, the data will be cached in CloudFront for an hour and returned on every subsequent call to /details.json. This data doesn’t need to be processed on every request and can be cached, so this fits perfectly into the origin request Lambda function scenario. Use CloudFormation to set up a simple Lambda@Edge function. The function should have an associate IAM role that allows it to have read-only access to S3 and pass through all requests straight to the origin S3 bucket by default. // There's no need to process so pass through as a normal request to S3. The function simply passes through to the origin S3 bucket if the query string doesn’t have the correct data. Adding in a Cache-Control header at this point is useful so that it does not cache into CloudFront until you remove that Cache-Control header or set the value to something different. The else block is where you process the data to generate the rugby tournament table data, who is winning or losing the league. You could generate the league standings directly from the S3 data. However, there’s a problem because at the point of processing, the Lambda@Edge function does not have access to the S3 data. The only thing you know is that the CloudFront cache does not have a cached version. To gain access to the data, the function needs to get the data directly from S3. This is now possible with the recent release of access to network calls from viewer events. To generate the current league standings, pull the data from S3 and process the data in the Lambda@Edge function and return JSON. Update the code in the TODO section of the function, with the following code, substituting your S3 bucket name where needed. The function is set up to generate the data for the current league standings based upon the S3 data. The function then generates a JSON response and returns the data in the callback instead of the request. Returning the response in the callback means that the S3 origin is never called, and this is used as the response instead of the origin data. This function then produces a cached dataset for a normal request. For a request with a specific query string variable, it computes a generated response that can be cached through using the Origin Request and Cache-Control headers. You could use different services to generate the league standings, such as Amazon DynamoDB or even another Lambda function, but this shows what is possible. In this example, the data is currently set to expire immediately using max-age=0. Because it is in an origin request Lambda@Edge function, the request could be cached in CloudFront by changing this value. For example, by setting the caching to an hour, you could reduce the compute here. You could even cache it up to a specific time. Publish a new version of the Lambda function. Add a CloudFront trigger on the origin request (for this example). Wait for the function to propagate to the edge. This post shows that it is possible to move compute to the edge, and provide lower latency solutions for some data processing and client applications. This gives you opportunities to increase the speed of your client applications and decrease the processing that happens on centralized servers. Within Lambda@Edge, viewer request–generated responses can be up to 40 KB in size and origin request responses can be up to 1 MB in size. There are also different timeouts and maximum sizes of functions. For more information, see Limits on Lambda@Edge. These may feel like limiting constraints but as long as you understand them, and take them into account when designing your applications, you can then shift compute to the edge and improve the latency of your applications for your users. Make your application not just serverless but serverless at the edge as well. Please visit the Lambda@Edge webpage to learn more and to get started.